Here we are at the end of another year! It's a great way to look back and relive, revive and rehash our Best of 2018! 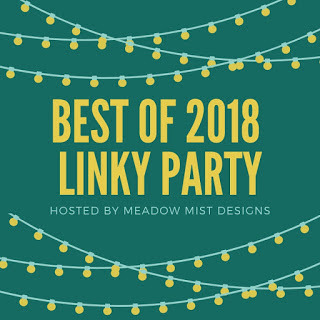 Cheryl at Meadow Mist Designs has a linky party every year as a way to celebrate our best finishes. This year I picked my top five (5) posts that received the most views. I hope you enjoy the trip down memory lane! This quilt was my math lesson of the year! I seriously had to calculate and recalculate in order for the pieces to all come together. I love everything about this quilt...color, design, quilting and matched binding! One of my favorites of the entire year for sure! Cheryl @Meadow Mist Designs and Paige @Quilted Blooms asked if I'd participate in the Modern Plus Sign Quilts Book Hop, and I jumped at the chance! This was my version of the Plus Surround quilt which I took a bit of a creative detour on! This quilt was by far the most labor intensive and unique quilt of the year! Quilting has always been a creative outlet for me and I wanted to take that creativity to a new level. This was my first 'textured twist' adventure! Speaking of 'textured twists'...another idea that became reality! I'd say this one had the kitchen sink of color thrown in at every turn. A combination of twists, log cabins and improv came together for an intriguing finish. This was my second version of 'It's a Gem'. After completing 'It's a Gem I', I felt the need to redeem myself. First in precision and second in design. I always want to put forth my best work, but I'm not shy about pointing out the flaws in my eyes. It was a very good year! Health, creativity, happiness...three things I hope to continue through 2019 and beyond! 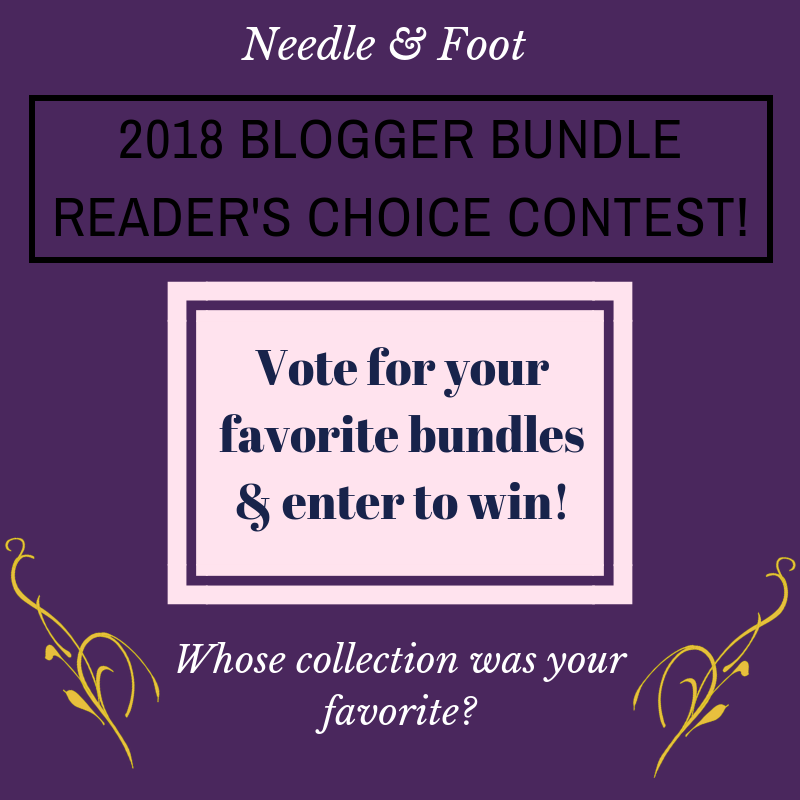 You can check out other blogs that have shared their Best of 2018 here: BEST OF 2018 LINKY PARTY. Which of course...I highly recommend! 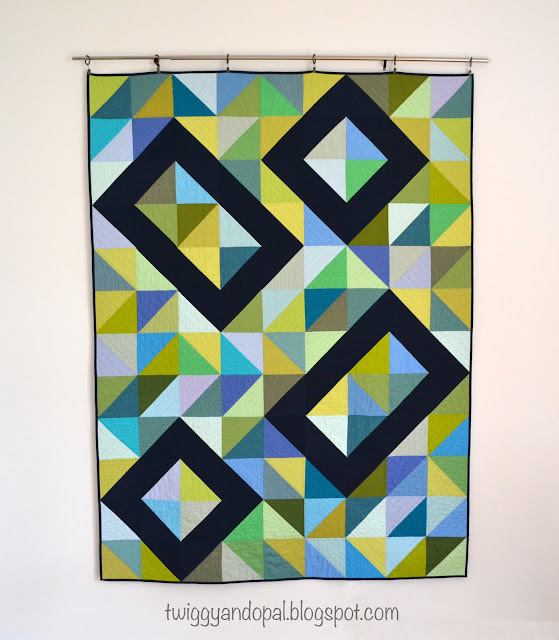 Before I get started with my latest post, I just want to address the latest Craftsy news. I'm sure many of you have heard Craftsy/BluPrint is reshaping their marketplace by reducing the number of stores and patterns. Many pattern stores will be eliminated, while others are allowed to stay. The shops that stay may find that some of their patterns will be eliminated. You won't know which ones or how many. Kind of crazy to say the least. My shop for some insane reason has been allowed to stay, while other major shops have been given the boot! With that being said, after Friday the 28th you will see a drastic decrease in patterns available. I suggest you go get the patterns you are interested in and download them as soon as possible. 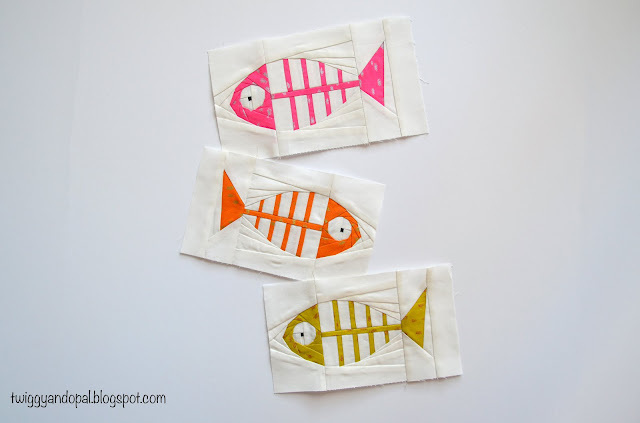 This paper piecing project 'Fishy Bones' is a free pattern from Unicorn Harts that I downloaded from Craftsy. Here is the link: Fishy Bones , if you have the slightest interest in it...go now and download it! Just in case it disappears! 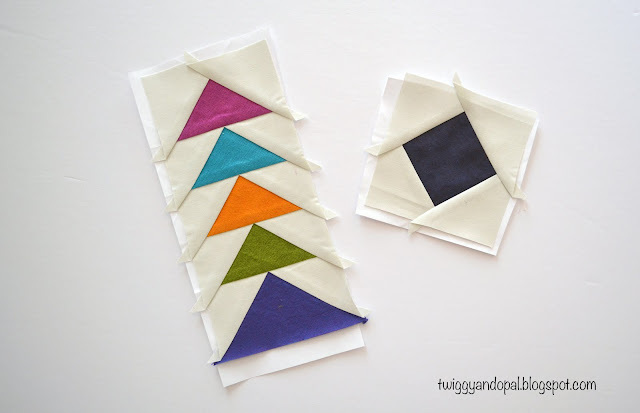 Way back in February as I was preparing for our Guild Retreat, I prepped a few small paper piecing projects to take along and make in between the big projects. Fishy Bones was one of them and as you can guess, I didn't make them! 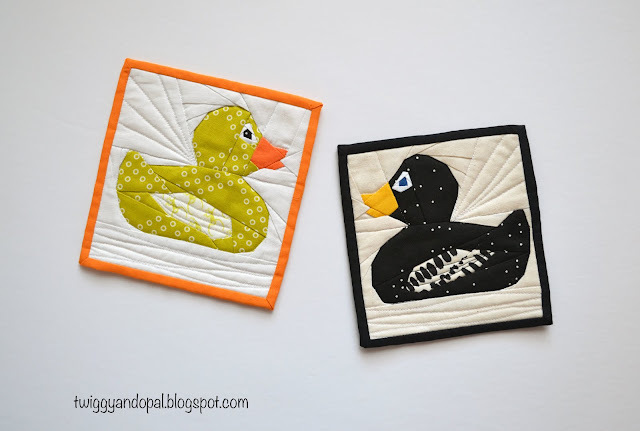 As I was sitting in my sewing room contemplating my next move, I suddenly remembered about these and decided now was as good of time as any to finish what I started! I grabbed the pink fabric and the pattern pieces and got to work. For the most part it went together fairly easily (minus human error again) and I soon had the first one finished. 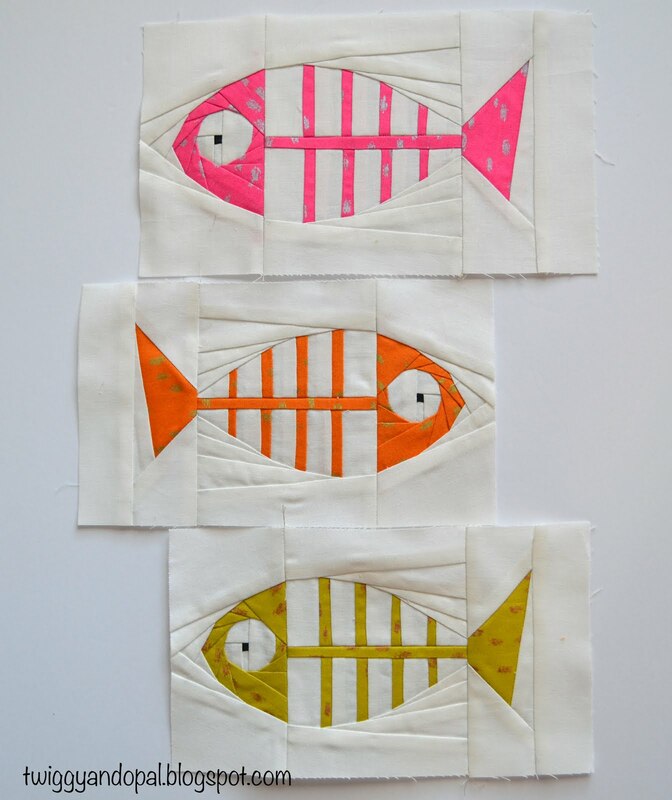 I may as well finish the other two, after all the patterns and fabric were already allocated for said fish! The fabric I used is called Heavy Metal by Whistler Studios. The colors are beautifully saturated and have a little sparkle of metallic in silver, gold and bronze. It wasn't until I made the second bag of bones that I discovered the pink fish is larger than the other two! Oops! That one finished at 9 1/2" x 5 1/2", and the other two are 8 1/2" x 5. Don't ask me what happened, I can only guess that I didn't pay attention when printing! As I was winding down on the third and final block, my husband informed me that he was going to wrap presents and I was not allowed to leave my room until he was finished. The estimate was 1-1 1/2 hours. Presents...of course I'll stay put! However, when I'm told I can't do something it always makes me want to do what I'm not suppose to do! I didn't want to stay in my room, but I did. What should I do though?! Since I was on the 'fish' and I happened to have one more template printed, I decided to make one more. Except this time I wanted it to be a fun, unique and crazy one! Who doesn't love a Christmas Rainbow?! He came out as I had hoped except for the tail! I wish I had pieced a rainbow for that section, but I can do it next time, right?! I think this one is a Rainbow trout though! What will become of these bones? Your guess is as good as mine at this point! It was all about doing and playing! I'll figure it out later! Are you wondering how the present wrapping went? First it took nearly 2 1/2 hours, second there were NO presents wrapped under the tree. How can that be?! He said he didn't want to put them out because I have the ability to look at a present and know exactly what it is without opening it! Not really, but I do like to see the pretties wrapped underneath the tree for a few days at least. This morning I woke to a note saying he would be wrapping presents today. What? I thought that's what he was doing last night! Turns out there's more to this story than I am aware of and won't know what it is until Christmas! I'll let you know how that turns out! Surprises...gotta love 'em! 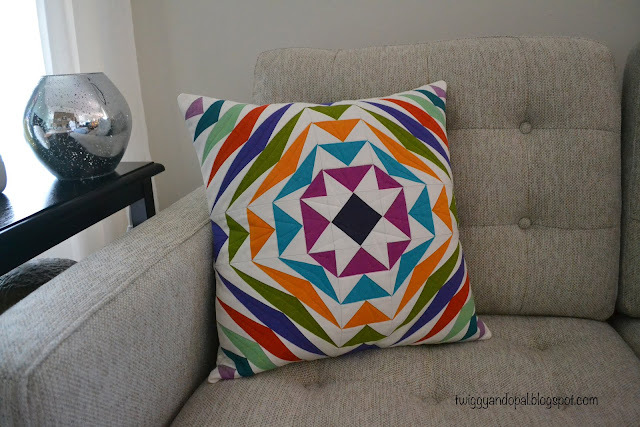 Here's a few patterns I love from Craftsy! First thing I do in the morning is check my Instagram feed. A little coffee, a little wake up time and a little screen time. 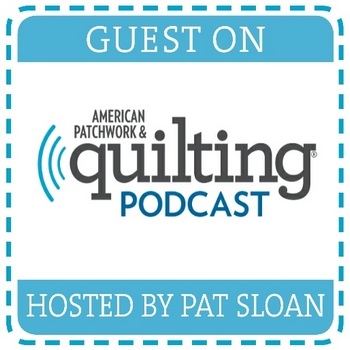 Right away I saw exciting news that we've all been waiting for...who and what quilts will be hanging at QuiltCon 2019 Nashville! I ran to check my email and lo and behold, nothing. I didn't receive a congratulations you're in or sorry your out! After contacting the powers above, they resent the emails that mysteriously disappeared. And to my shock and surprise all my entries were accepted! I was sure there was some sort of mistake so I waited until the end of the day before I believed it. I entered five quilts, two of which were last minute entries just for the fun of it. 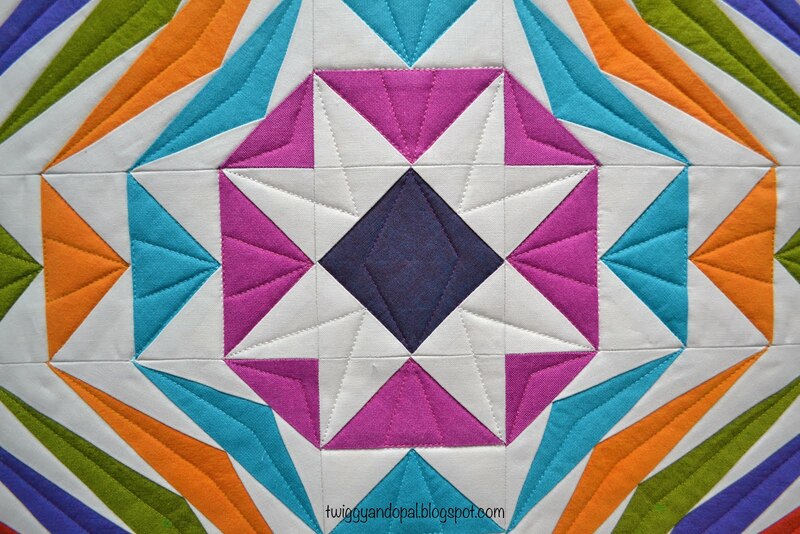 If fun is entering quilts and practically bearing your soul! It isn't easy for me to shout from the rooftop about this, but a very wise woman said to me 'be proud, you worked hard, soak it in and celebrate' and so I shall. Thank you for the pep talk Debby! Here are the quilts that made it! 'Louver' is so named because it reminds me of the slats of a venetian blind. By changing the angle of the slats it changes the amount of light that gets in. It was my first 'textured twist' quilt and one that I made specifically for QuiltCon 2019 in hopes it would make the cut! Steel, beams, rivets...all part of a structure that is vital in the building of bridges. My mind kept wandering to my days in Portland Oregon where steel bridges are part of the landscape, part of the history of the city. Hypnotize: capture the whole attention of someone; fascinate. I couldn't get this 'textured twist' idea out of my head! The simplicity of black and white with an optical illusion effect proved to be a challenging feat! This was a last minute entry. While I love it to death, I wasn't sure it would be worthy but decided to take a chance. This was literally entered in the final day to submit quilts, the final hours! I'm not sure what drove me to enter it. I seriously did not think it had a chance! 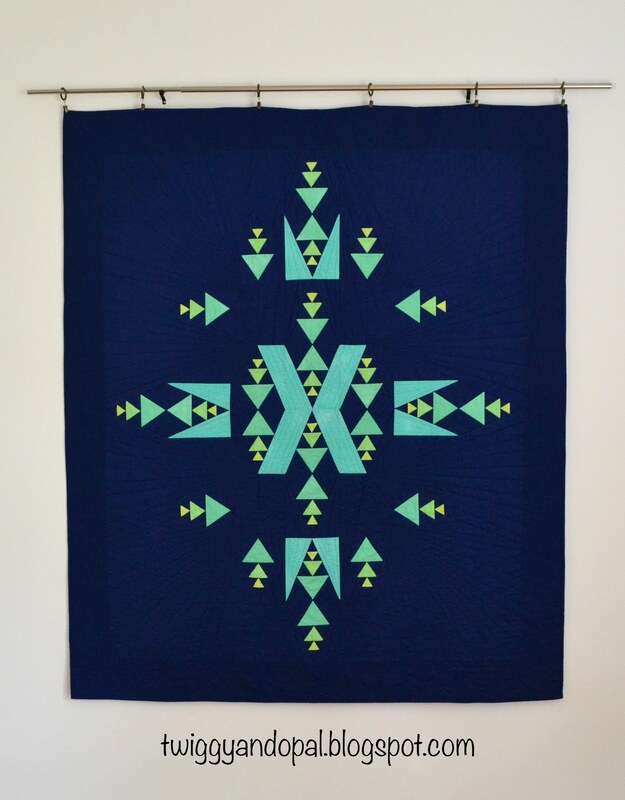 I'm excited to see my quilts hanging! 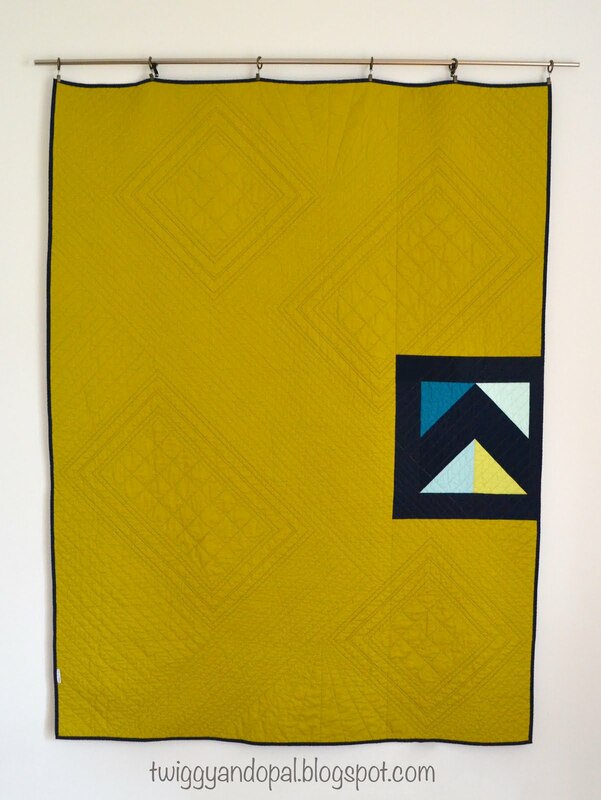 I'm excited to represent Nashville and QuiltCon! I'm beyond thrilled! 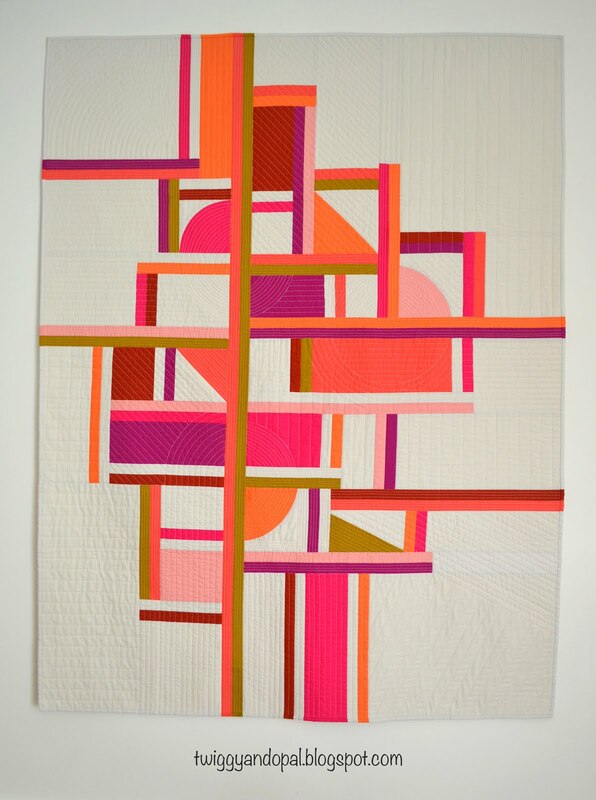 But mostly I'm excited to attend my first QuiltCon and meeting people...and seeing amazing quilts! It's usually the time of year to think about Stocking Stuffers, I on the other hand have been focusing on my Closet Stuffers! This could possibly be that last one, the last one for this year seems more like it! 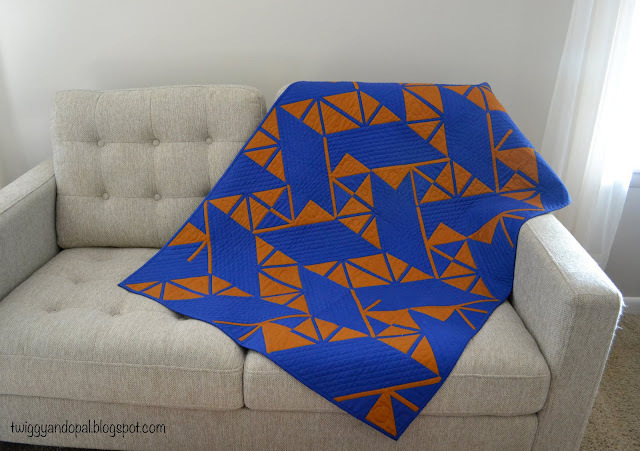 This one was held back with the intention of writing a pattern for it. Big surprise! That didn't happen. If there's one resolution I'll make this year it will be never talk about or promise to make a pattern for one of my designs! I'm not saying I won't, I'm just saying mums the word until it's finished! 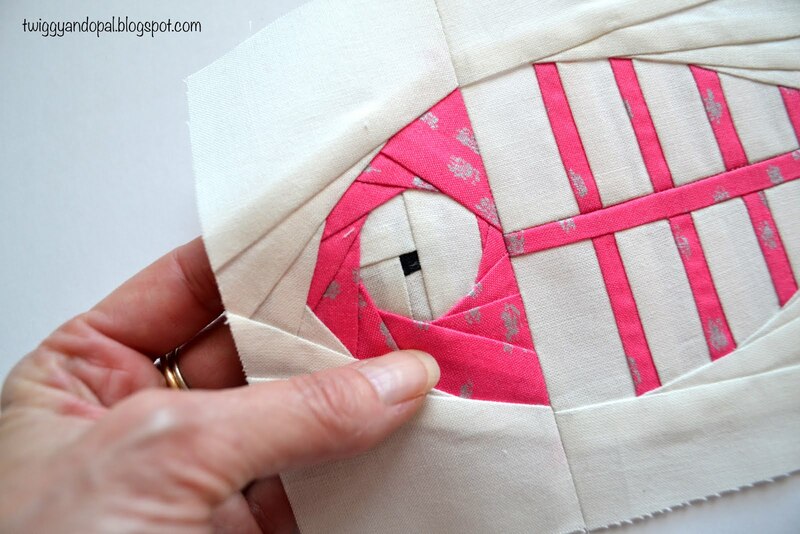 I designed and made a small version of this paper pieced design way, way back in January. 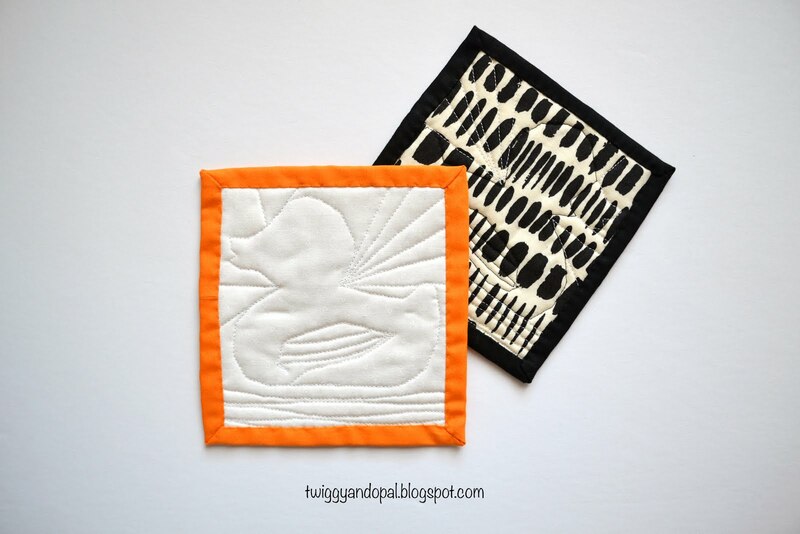 You can check it out here: Black & Orange. I tried the design with a small quilt first just to work out all the details and to see if it would come together. And it did. That motivated me to give the design another chance and go bigger! It also gave the the opportunity to use a stack of hand dyed fabric my daughter Britt made me long ago. 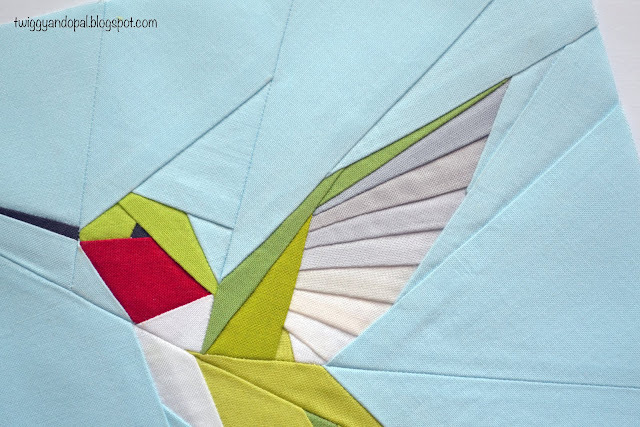 Gotta wait for just the right project to come along before cutting into our favorite fabrics sometimes! There was a variety of gorgeous color in that stack from aqua to lime green! I choose Kona Nightfall because I thought it would be a good background to highlight the colors of the hand dyed fabric. 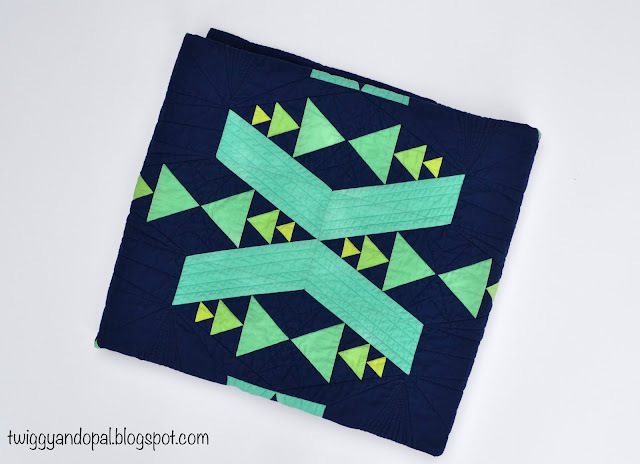 My last blog post I used Nautical, this time Nightfall! It seems I went through a dark blue phase! For reference, Kona Nautical is the darker of the two shades. When I began designing this quilt, I wanted stacked triangles in some form or another. I ended up with a block that was rectangle and then the fun began! 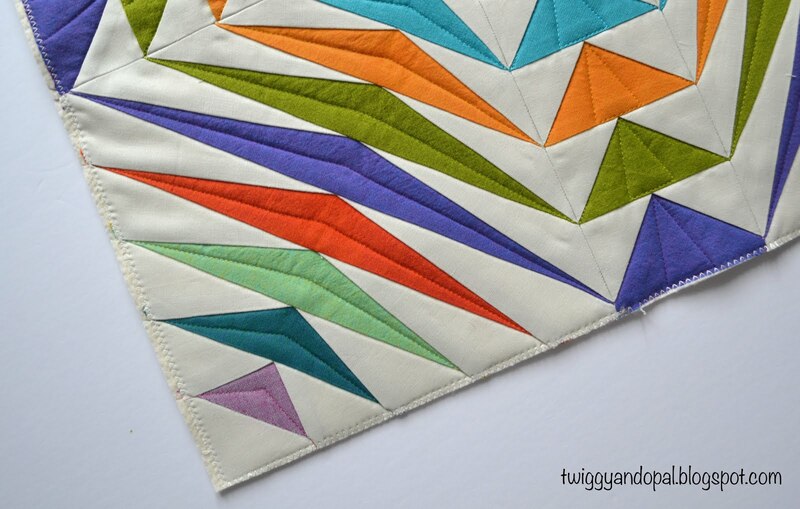 There is a lot of maneuvering and color play that happens when designing. I couldn't imagine doing with out my EQ program! 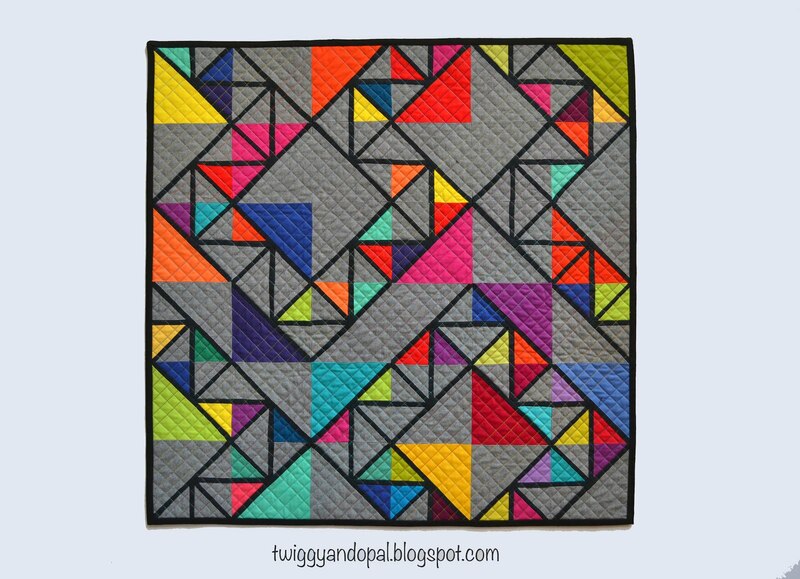 I was happy with the layout, the way the big X landed squarely in the center, how the triangles seem to float around the edges and the millions of color possibilities! Once you settle on a design you have to go with it. At least for the first version! 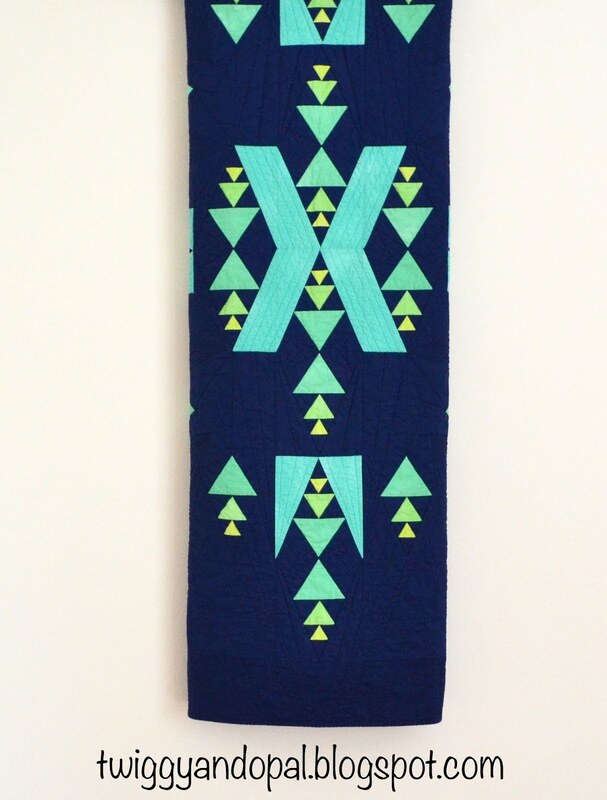 I haven't yet, but I look forward to the day when I can revisit this quilt and scramble the design to see what other options are possible! I wonder why that aqua strip is on the side?! My usual "I'm just this much short" seems to always make an appearance! Don't get me wrong, it bothers me not at all! 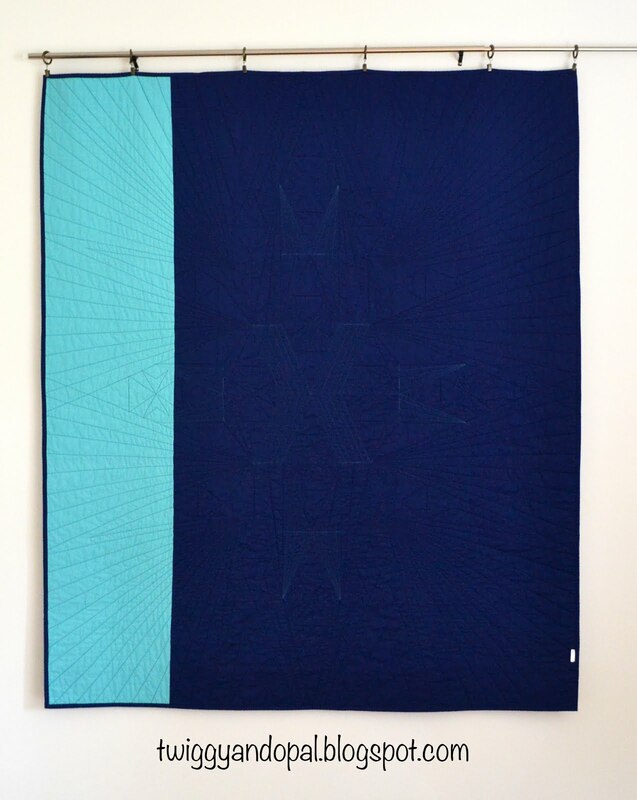 You can't make out the quilting design on dark blue, but on the aqua you get a sense of the geometric design I did. 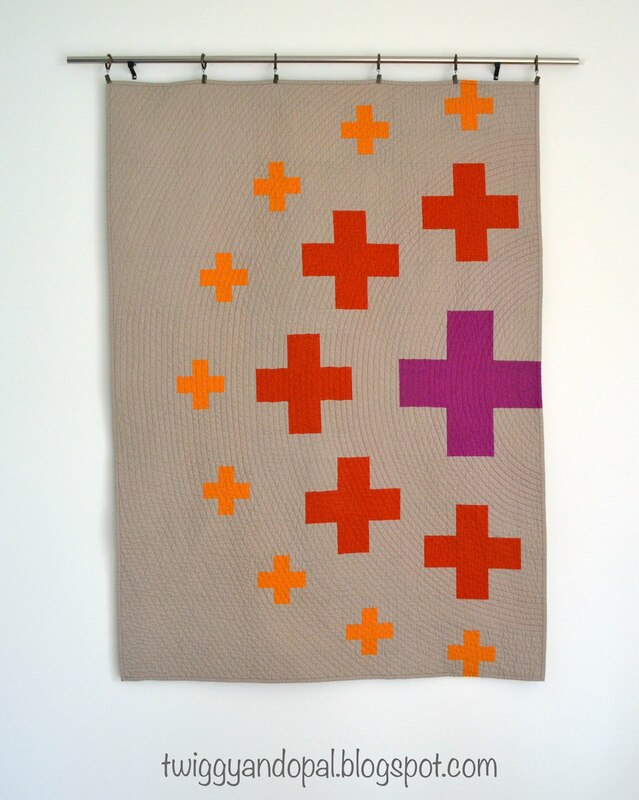 It's effective and did it's job of unifying the entire quilt. The color in this photo is not even close to what Nightfall is in real life! 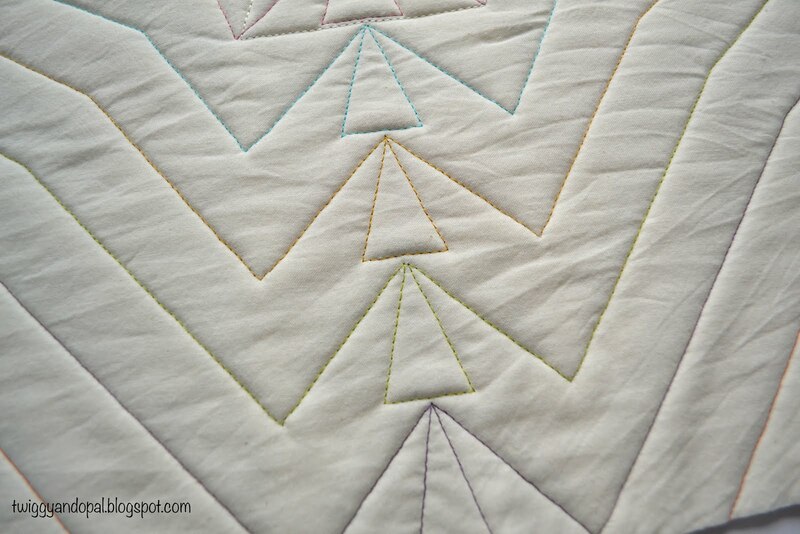 But you can get a better sense of the quilting that was done. Paper piecing is so satisfying! Right now I'm working on another paper pieced project I designed and hope to make it my first finish of 2019! Planning ahead! It'll be a color palette that I rarely visit, but one that is kind of pretty! Stay tuned! Do you make New Year Resolutions...that you keep?! 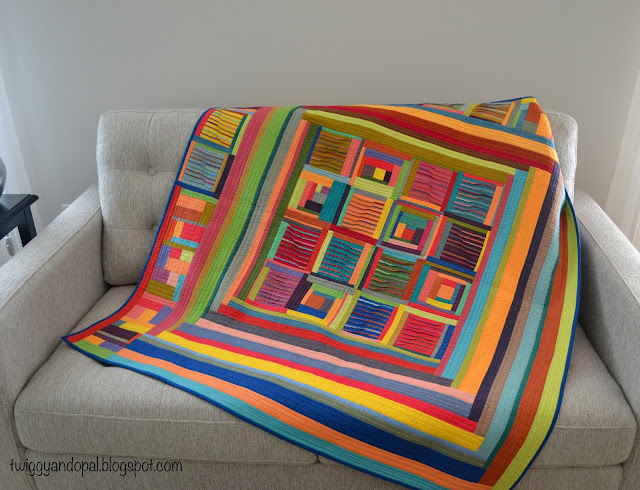 There was a time not too long ago when every quilt I made was photographed and blogged about the second it was finished. 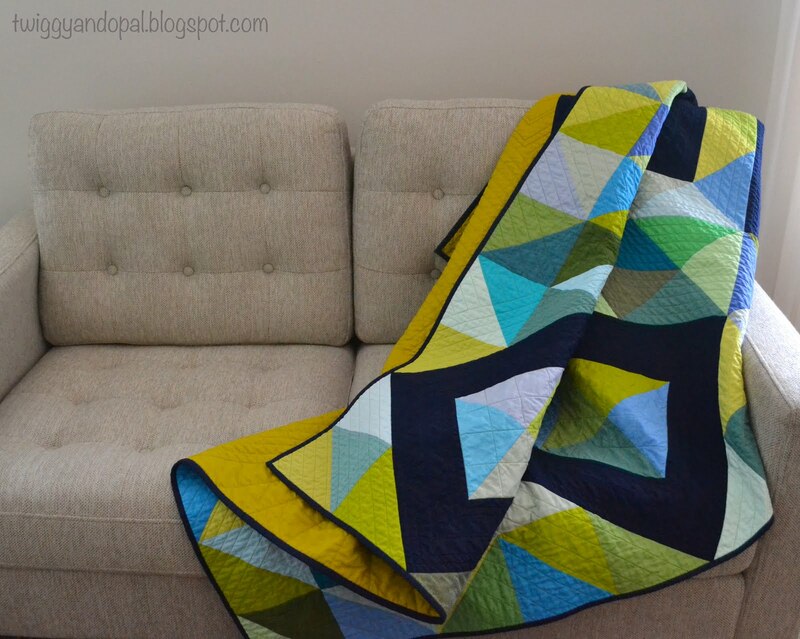 It was a stead fast goal of mine to finish a quilt before I would start a new project. That doesn't mean I wasn't thinking about the next project, it meant I had to wait and that was pretty exciting to me. 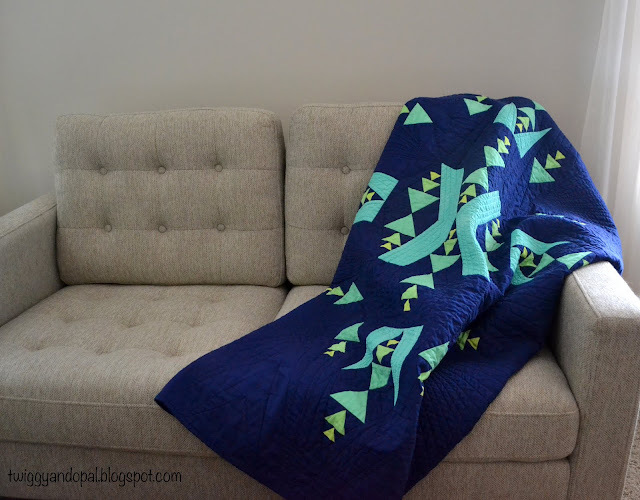 There were never WIP's, never a pile of quilts to quilt, and I was proud of that. Somewhere along the way my rules changed. I became a rebel! Okay, not so much a rebel maybe I loosened up a little bit! I'm certainly not complaining! With my new found freedom I've discovered a quilt or three that was stowed in my closet waiting for...what? I don't even know! I probably shoved it in there so I could make room for another project to get underway! I know it's not abnormal to have half a dozen things happening all at once, every one does, and I shall not dwell on the good old days, instead I'll embrace it and move on! 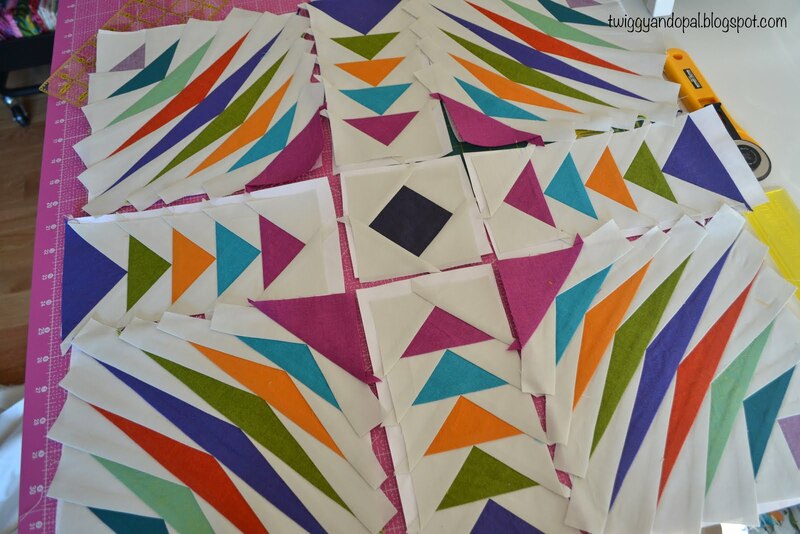 I'm intrigued by geometric shapes and half-square triangles are a fantastic way to experiment and play. 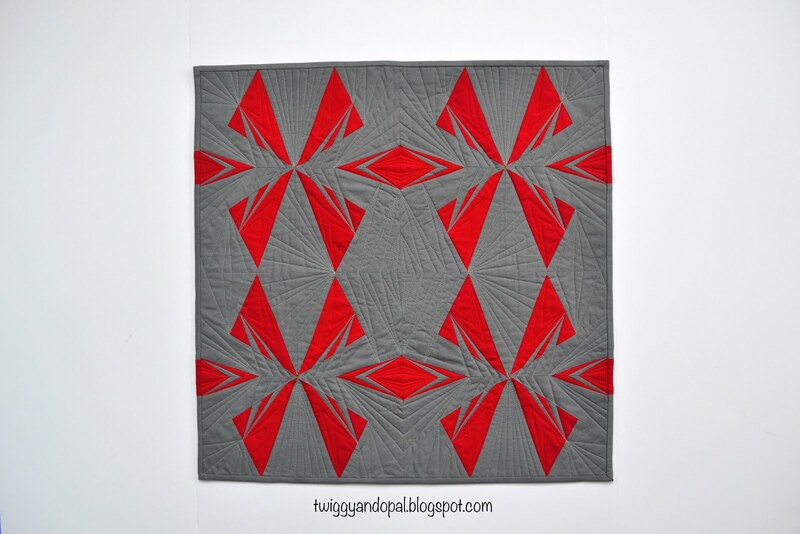 I could spend hours if not days turning, flipping and moving the blocks to create different patterns. I've fallen in the rabbit hole far too many times! This time I stuck with a plan and besides moving a few background pieces, it was written in stone! The squares and rectangles are Kona Nautical, which in this picture look black, but in reality it's a very dark blue. I arranged them semi haphazardly and filled in with a lot of blue and green HST's in many different shades. 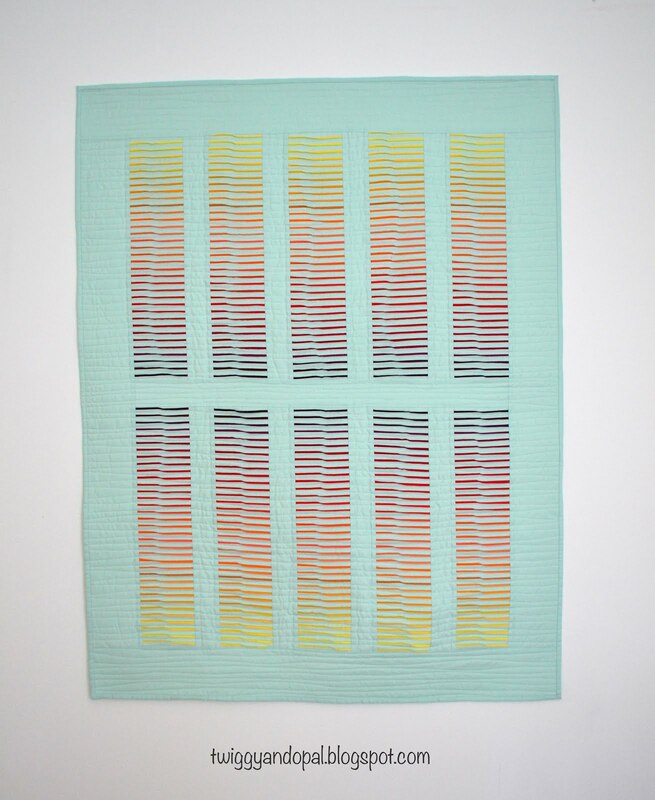 When I start a quilt like this, I grab every fabric in the color scheme I'm going for and cut all my squares. Generally I'll cut 2-5 squares in each color, but it depends on big my chunk of fabric is. Then I'll grab my stack and randomly pair up sets. That way I'll have a bunch of different combinations of colors after the HST's are made. Random is better for me. 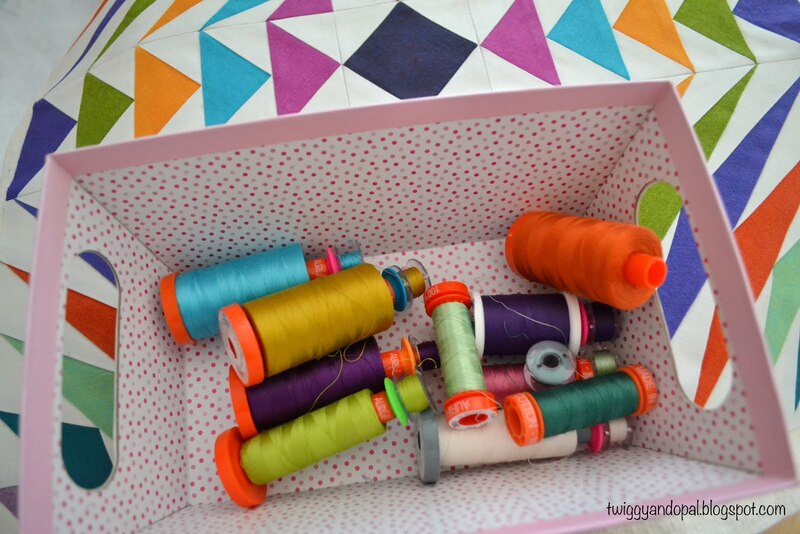 They say variety is the spice of life and that holds true for me...but only when it comes to quilting and fabric! Sometimes when I'm pulling fabrics for a 'theme' color quilt, there are shades I'm not in love with. I have to force myself to use them anyway. I may only cut 1 or 2 blocks, but I throw them in the mix for variety sake. 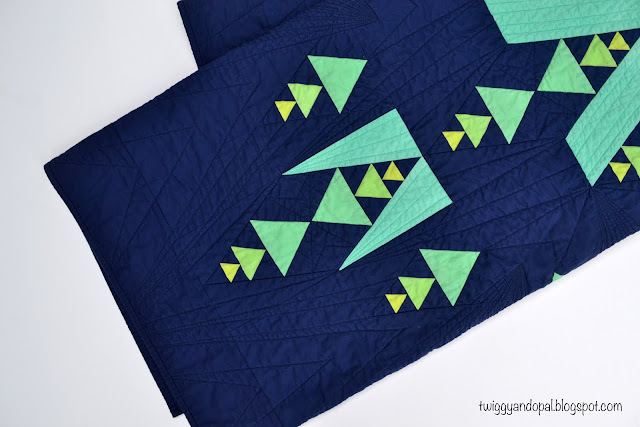 What would a geometric quilt be without geometric quilting? 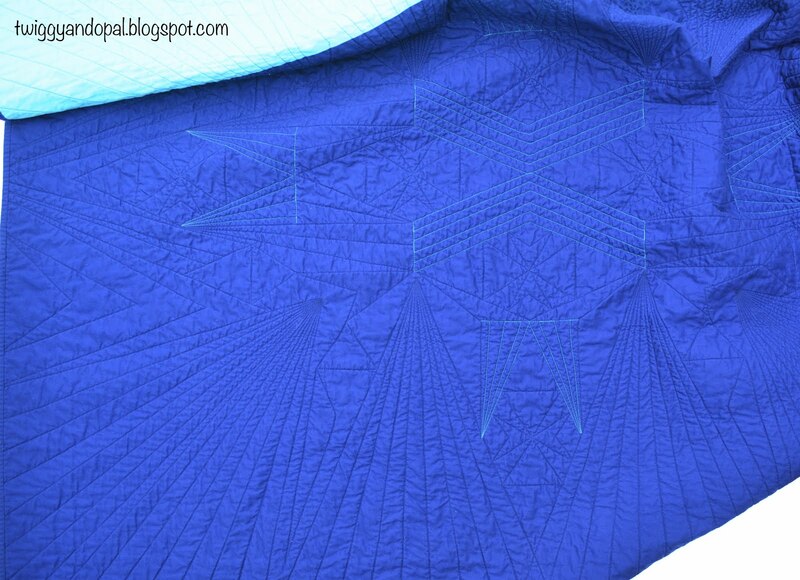 I printed a coloring sheet via EQ8 and began the intense quilting process. I started with the squares and rectangles first. Stitching in the ditch and then quilting a 2" grid inside each shape. After that it was a puzzle of lines. I tried to keep a flow with the lines so it didn't look too haphazard in the end. It worked and every inch was covered! As always there were blocks left over and as almost always I didn't have a large enough piece of fabric for the entire back! By adding the extra blocks to the back I was able to stretch my backing to fit and give the back a little visual interest as well. The backing is Kona Pickle, which I love! It's a rather bold and different kind of color that not everyone is attracted to. I added a binding of Nautical and this guy was done! Well, this guy was stuffed in a closet! When I finally released it from purgatory, I washed and dried it for the a true finish! 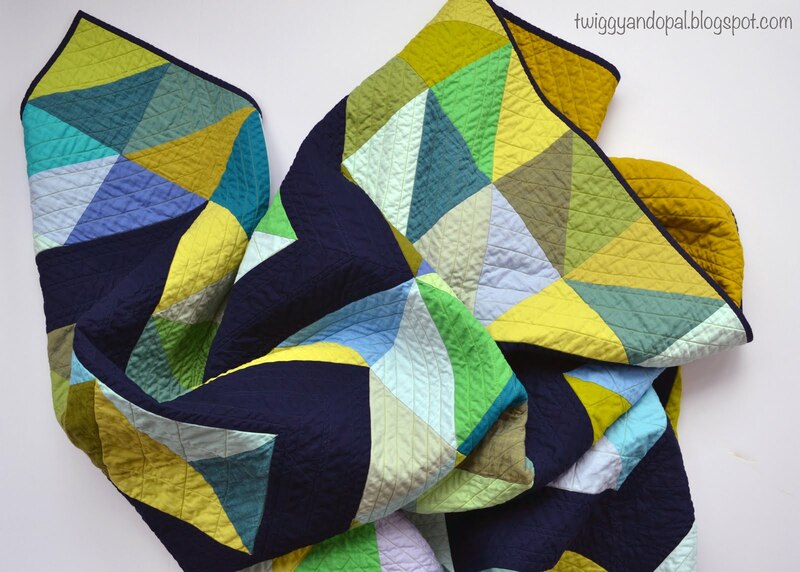 To me, a quilt isn't truly finished until it's been washed! I do want to get back on track a little bit with project finishing. Maybe that should be my New Year Resolution?! Probably not! I've never ever ever followed through on a resolution...why start now! Being the end of the year, do you scramble to finish WIP's and UFO's? I know I do! I want the old gone and make room for the new! Are you lucky, feeling lucky or hope to get lucky?! I've got a Mega Giveaway to tell you about! Bernie @needleandfoot is hosting a super exciting huge giveaway! 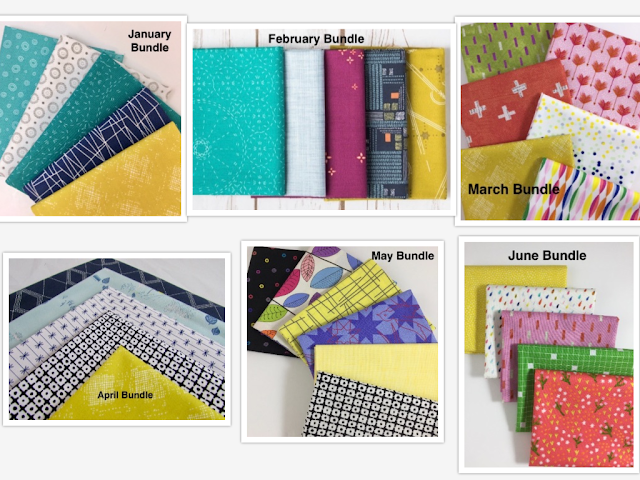 Many of you already know about Bernie and her blog, you may also know about her Etsy fabric shop Needle & Foot, but did you know she has been hosting a monthly Blogger Bundle in her shop too? 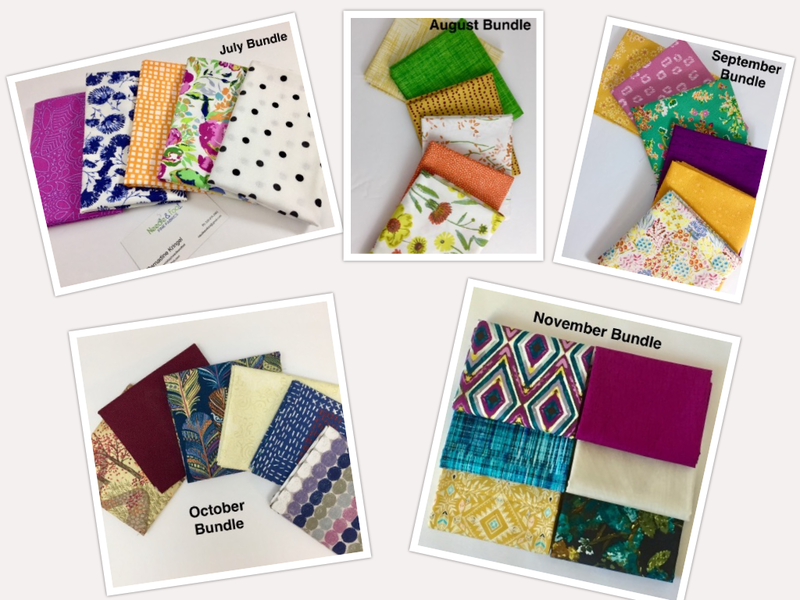 Over the past year Bernie asked eleven blogging people to curate a bundle of 5-6 fat quarters which she then sells the in her Etsy shop. Unbeknownst us, she made extra bundles...eleven to be exact, that she saved for a huge giveaway! Winner takes all! All! Can you imagine what you would do if you won something like this?! Me too...cartwheels for sure! I'll post the link at the end of my post. All you have to do is go to Needle & Foot blog and enter by picking your favorite collection! Who's will it be? Mine?! Perhaps! Wanna see the bundles? Of course you do! You may drool a little bit and that's okay, but just remember...you can't win if you don't enter! Tell your family, tell your friends! I'll just point out that my bundle was May. You know...in case you wanna vote for it! A little friendly competition never hurt anyone! I've known Bernie for a couple few years now, and have come to admire and respect her. She is a kind and generous sole who loves fabric and is more than happy to share her passion with all of us. This giveaway shows her generosity and her giving spirit. 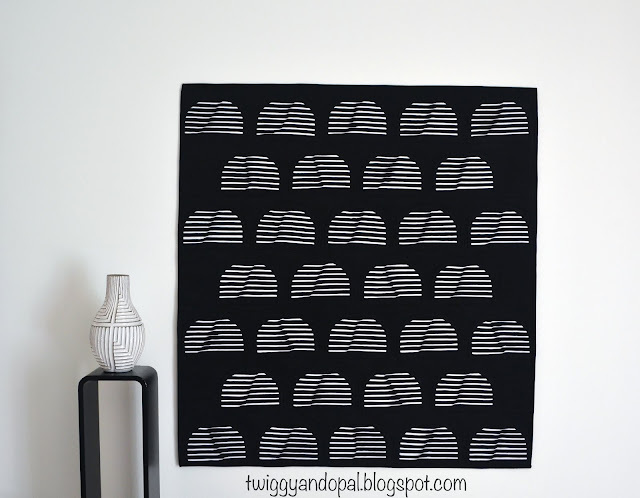 Take a look at her shop, read her blog and by all means go enter this giveaway! It took a while for me to figure out what design I would choose for my Secret Santa Swap pillows, but once I did there was no holding me back! I was excited when my partner requested pillow covers, and that one of their fabric loves was saturated solids. That I knew I could work with! I searched for the right design, that perfect 18" block that would make a big impression and wow the recipient. 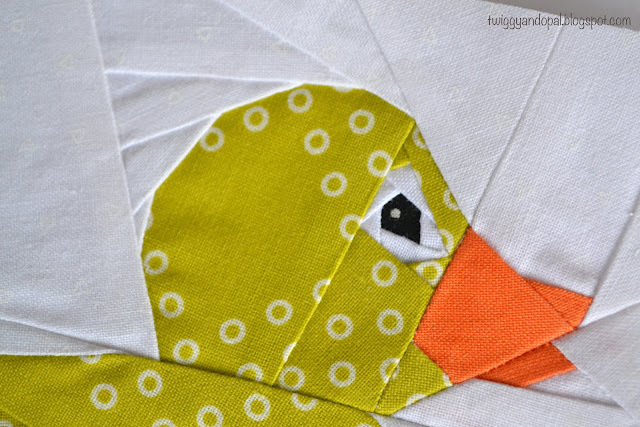 When I came across this paper pieced pattern: 'Geese Crossing' designed by Three Owls Handmade on Craftsy, I knew it was the one! That was the easy part! 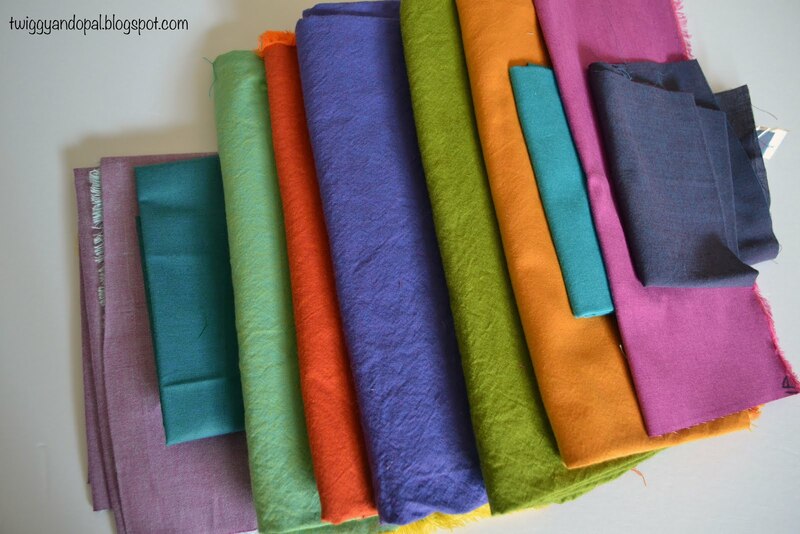 We all know that choosing the right fabric can sometimes be the real challenge! When I saw my stack of peppered cottons...I knew they would be perfect for the design. If you aren't familiar with shot cottons, the big draw is the depth of the colors. 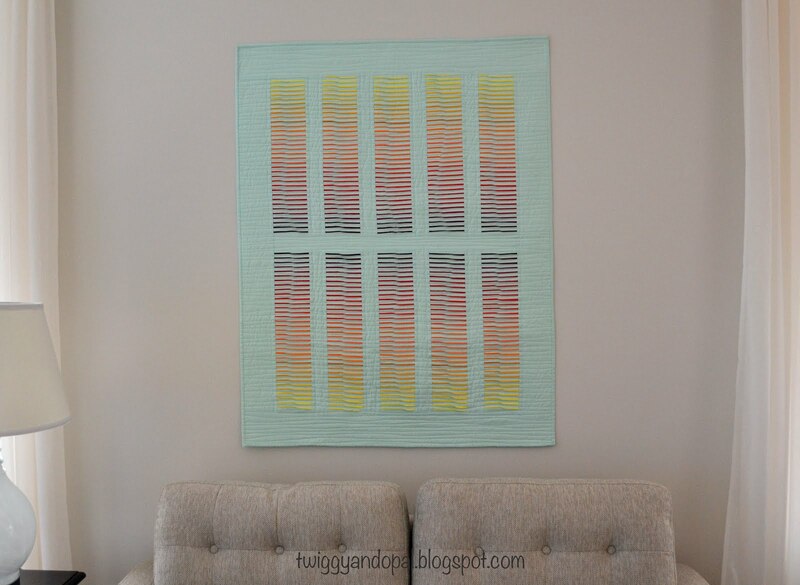 They are woven with two thread colors: the warp & weft. Debating on background choices proved to be difficult. In the end I went with a warm gray of Kona Haze. I had plenty yardage on hand for the front and back panels. I wasn't going to take a chance on being short of fabric! 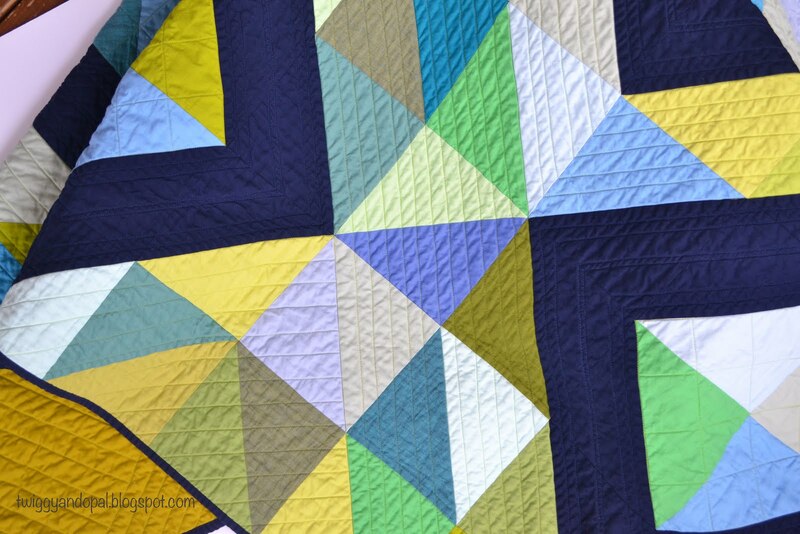 After deciding color placement, I started with the arguably easiest pieces, flying geese and a square-in-a-square. 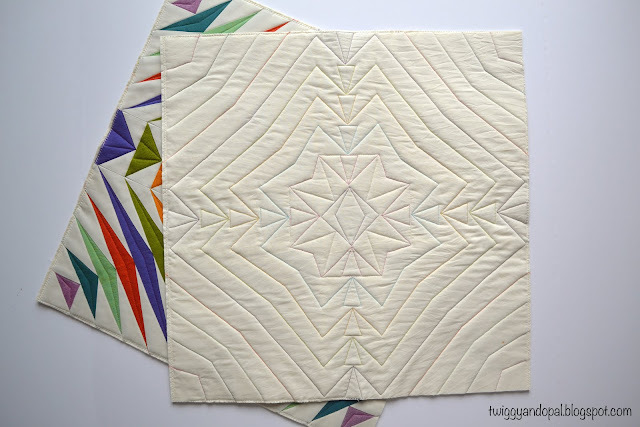 At this point I was reminded why I love paper piecing! I'm not sure I would have been able to get those points so perfect any other way! Next up were the corner blocks. 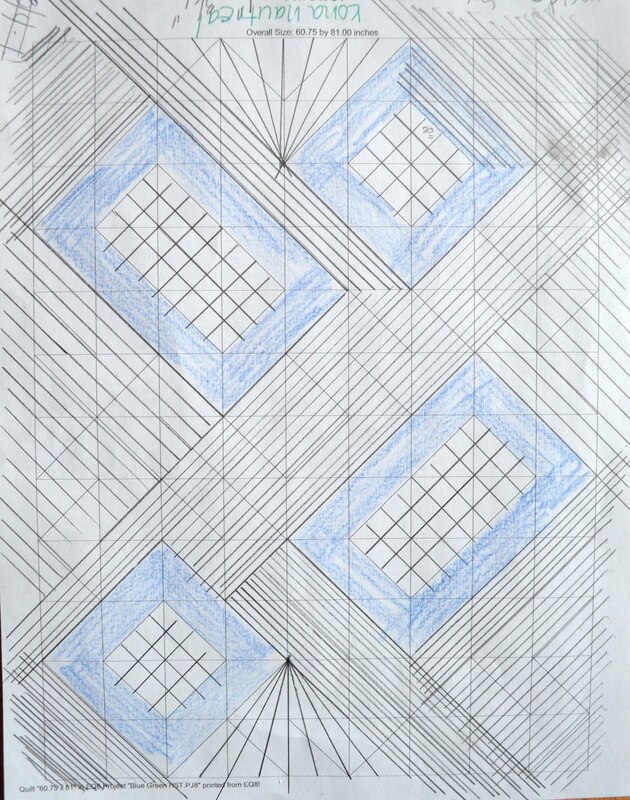 I began by making one square, measuring and writing down the width and length of each piece needed for the sections. Then when it's time to sew, I can grab the piece I need for the sections and not have to worry each time if I cut the right size. It makes the process much more pleasant, easier and faster! 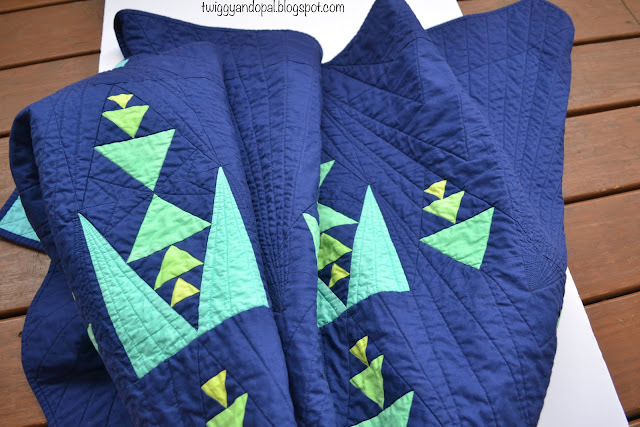 Once the front panels were pieced, I contemplated how I should quilt them. It didn't take long before I came to the conclusion that simple was better in this case. So I grabbed some coordinating thread and mapped out my moves! I'm shocked that I was able to stick to my guns and keep it simple! After I finished quilting to this point, I wanted to do more! I thought about quilting something in the Haze background fabric, but restrained myself! It was just as it should be and anymore would be too much. The back of the panels show the design much better than the front can. 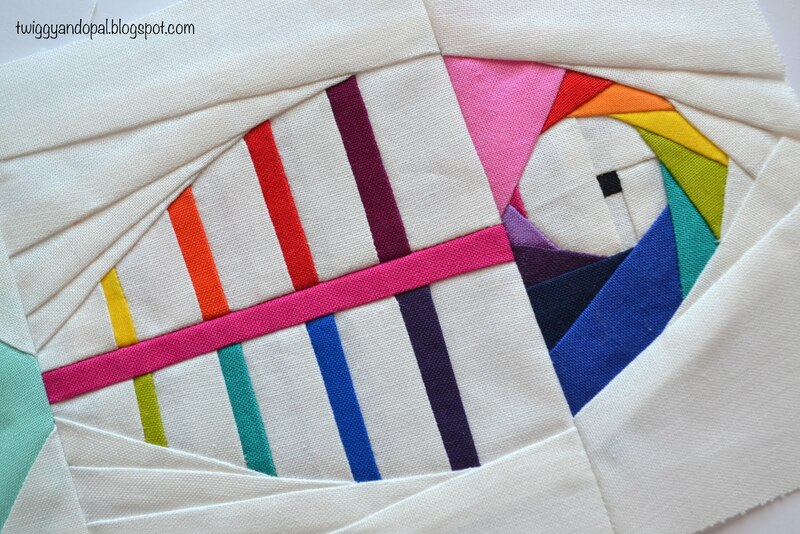 And this close up shows the thread colors. I'm very pleased and happy with how they turned out. I made hidden zipper backs for each pillow, gave a good pressing and wrapped them up with a couple days to spare before our guild's holiday party! I knew I'd get my secret gift finished in time, it just took longer to come up with a plan than I would have liked. The party was yesterday and was a fun and rousing event! Plenty of food, chit chatting, and as always fun! My partner loved her pillows and 'oh what a relief it was'! Stress melts away afterwards and you realize it was all worth it! Now to focus on the next part of the holiday season...shopping! ARGH! Who else doesn't like to shop?! For The Birds or the Fun! Finding time to make projects from our bucket list isn't always easy! My list is much like every other persons, long and always getting longer! As much as I'd like to make every single project on that list, realistically it isn't possible. In the end I tackle small projects that take hours instead of days to make. 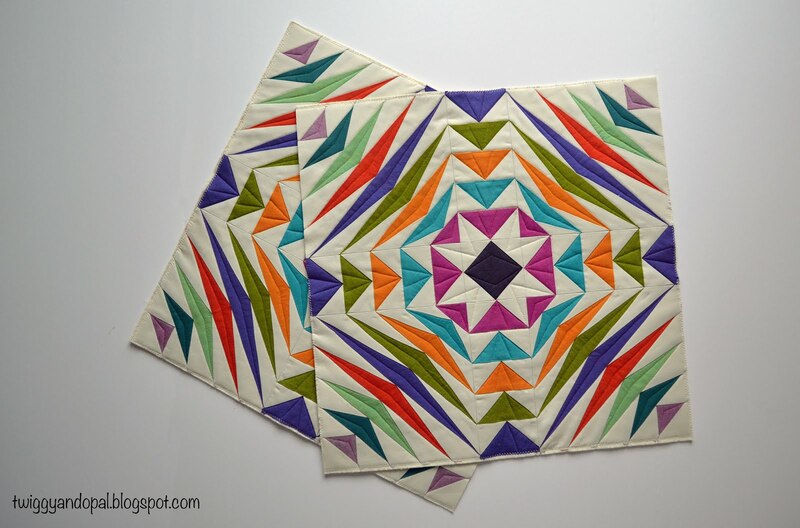 With a bit of time on hand I seized the moment and made a few Mini Mini quilts! It satisfied my urge! At least for the time being! First up is this amazing Hummingbird Mini! I love hummingbirds! 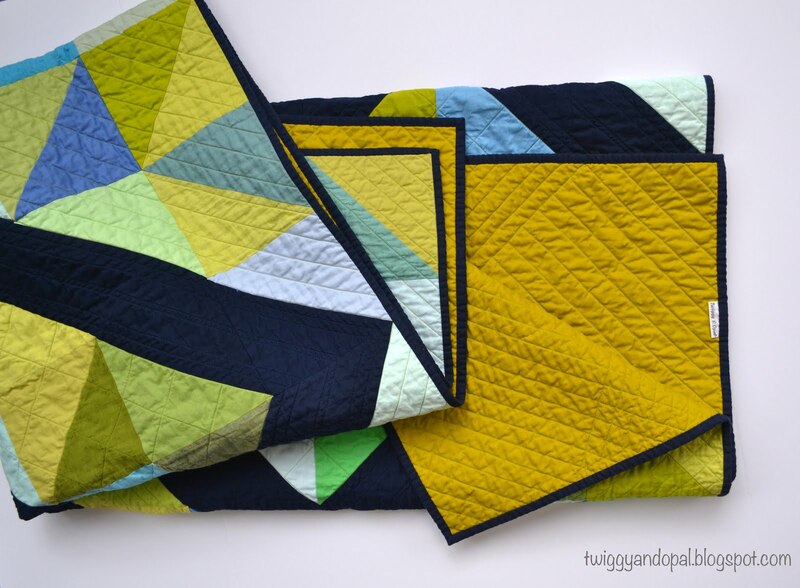 Nicole Young @lilllyella designs amazing paper pieced patterns! When I saw this one I knew one day I was going to make it! 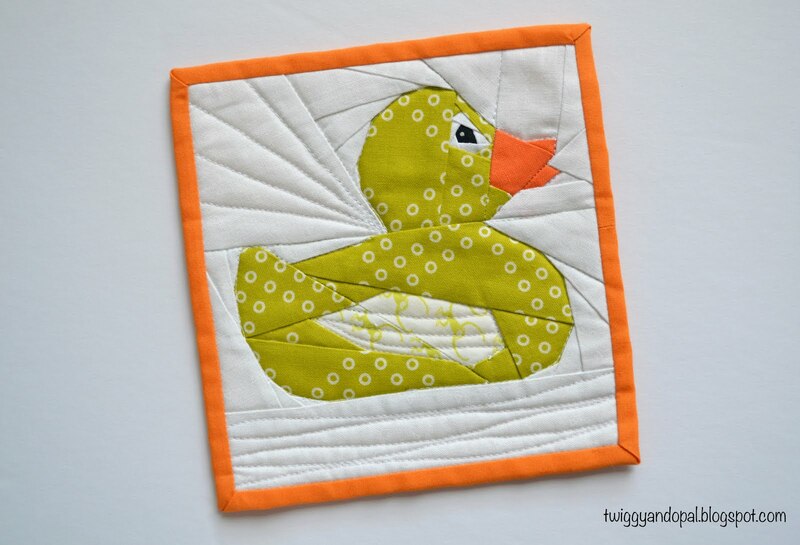 'Sugar Baby' is one of Nicole's free patterns available here: Sugar Baby! The Ruby-throated Hummingbird is probably the first one we think of when talking hummers! The iconic iridescent red throat and emerald green body is always a beautiful sight to see. 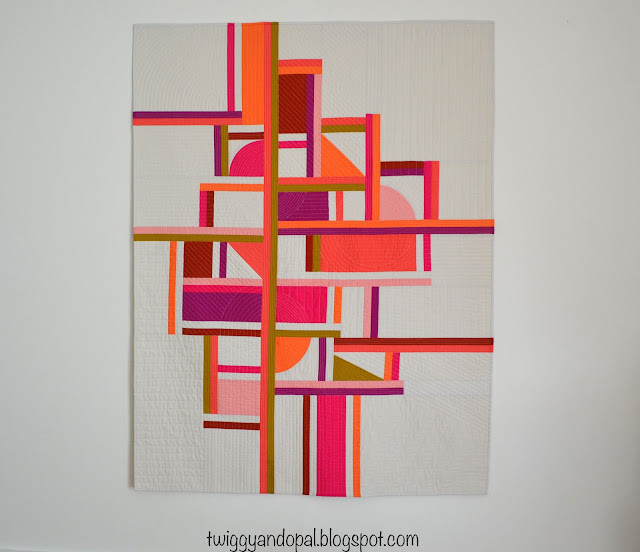 The block was not terribly difficult to piece which made me happy! It took a couple hours to piece the block together with not one single mistake until I was putting the sections together! That was human error and not anything to do with the pattern! The crowning moment for me was the wing! I picked the gray fabric the night before, but knew I needed daylight to make sure the gradation was going to be perfect before I began making it. I couldn't have been any more excited and happy at how it turned out! It makes me want to drool! 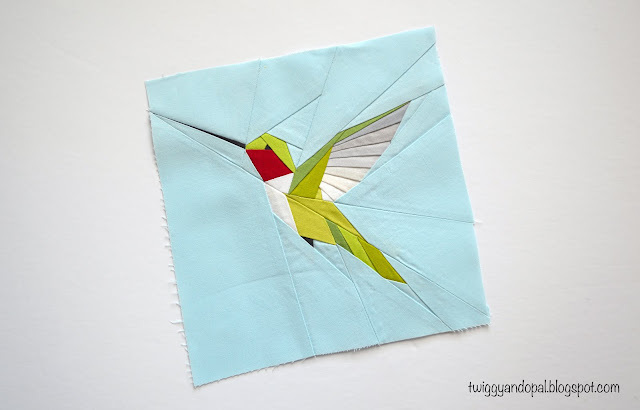 I kept the quilting super simple by stitching around the bird and adding lines radiating out. 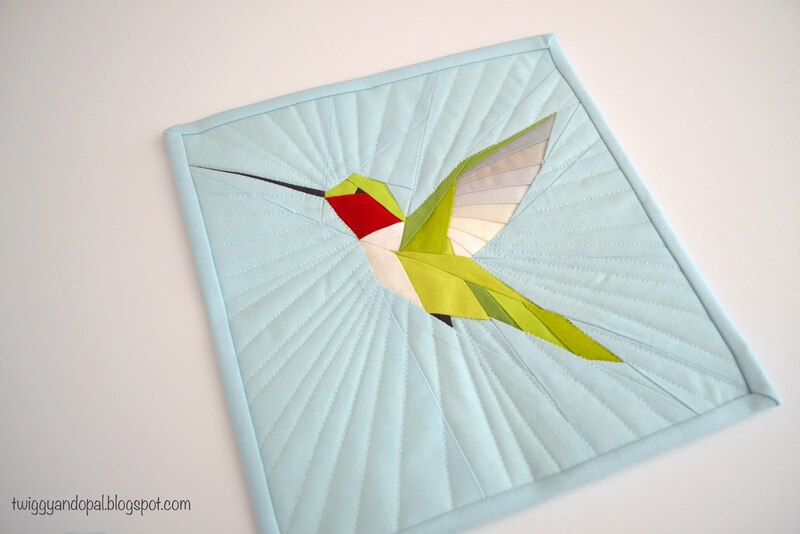 I wasn't going to take a chance ruining the bird with unnecessary quilting! I made this mini for my Mom who loves hummingbirds! She loves to watch hummers, and now she has one that isn't going south for the winter! As promised in my previous post: Rubber Ducky, I made a couple mini rubber duckies! You knew I would! 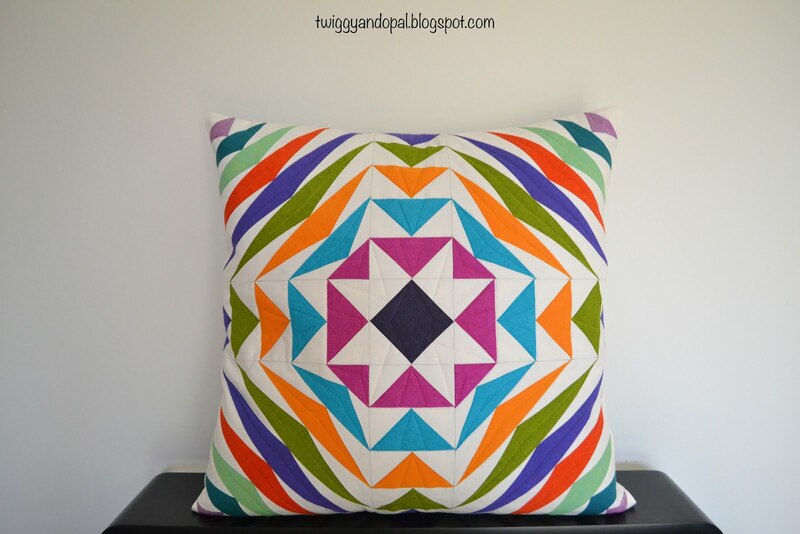 I took the existing pattern and reduced it by 50%, so what was a 10" block became a 5" block. The hardest most tedious part were the eyes! Yikes! Even on the large duck the eye was difficult! Cotton + Steel I knew it would be perfect! He's a blue eyed handsome little guy! 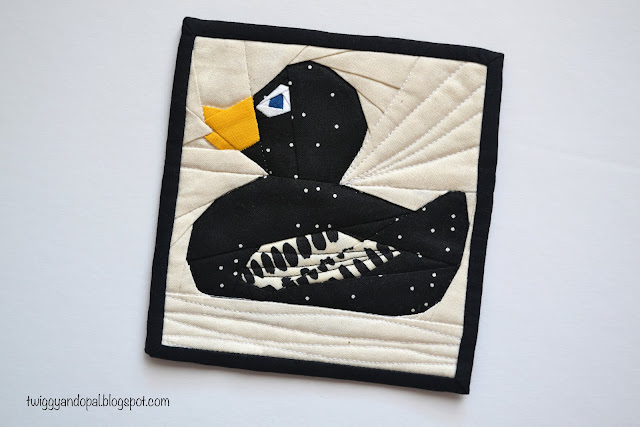 Simple quilting and finished with a binding of black! Why make one when you can make two! I choose a lime green print for the body and if you look super close at the wing you can see monkeys! When it came time to piece the eye I had a brilliant idea! 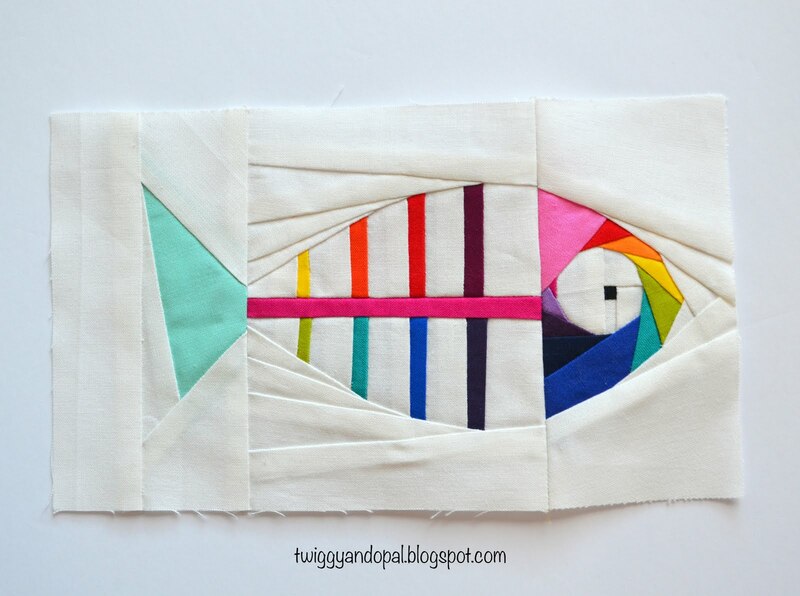 Why not use a dot from the 'Sprinkles' fabric for the eye?! So, I did and he now has a glint in his eye! If I ever make another one you can be sure it will get the same eye treatment! From the back you can see how I quilted them. Keeping it simple was the key! And for now my fine feathered friends are hunkering down for the winter! Do you have a bucket list? Are you able to cross things off on your list? 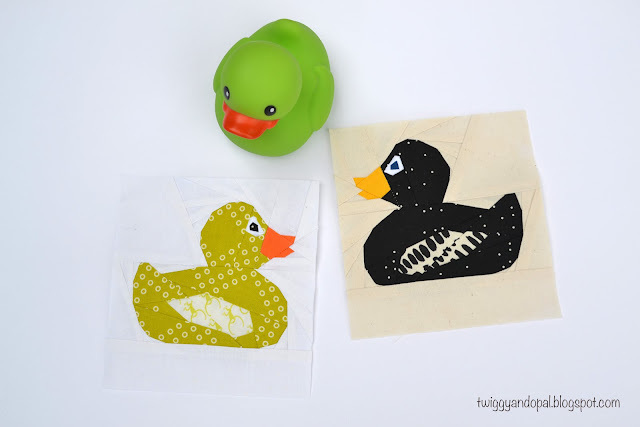 Block Printing :: Sweet Surprise!